Hollywood hot dog legend Pink’s Hot Dogs is one of the most – if not the most – famous and busiest hot dog stands in the country. 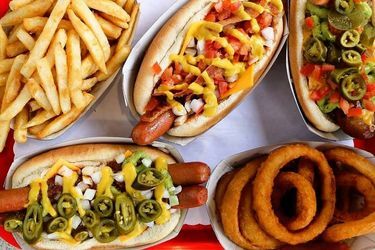 Dishing up dogs since 1939, their Chili Cheese Dog is still a favorite of customers (and of Bobby Flay), having been chomped on by The Best Of, FoodNation and Throw down. The new restaurant will serve a hot dog created just for the location, dubbed the Route 101 dog, it will feature a spicy Polish dog topped with nacho cheese, American cheese, grilled onions and chopped tomatoes. 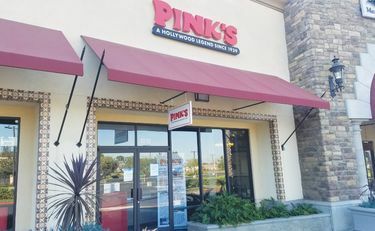 Other menu selections will include Pink’s trademark bacon chili cheese dog, the Guadalajara dog made with relish, onions, tomatoes and sour cream, and the Italian dog topped with sautéed peppers, onions and mushrooms and finished with chopped tomatoes and melted mozzarella cheese, Pink said.